Does your child struggle to hold their pencil correctly? Handwriting tutor Michelle van Rooyen explains how a pencil grip could help with their handwriting. 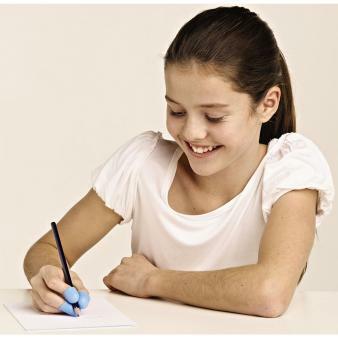 Learning to hold a pencil correctly is important if your child is to be able to write comfortably, fluently and legibly. But while most children will master a decent pencil grip in time, some need a little extra help to train themselves to use the correct grasp. Pencil grips are a temporary measure to encourage a better pencil grasp and make handwriting less painful. They tend to be better suited to older children, as younger children may lose them – or chew them! A soft, giving rubber-style comfort grip that makes the pencil look like it’s wearing a superhero cape! It’s specifically recommended for children who wrap their thumb around their index and middle fingers when holding a pencil. Its large size helps with pencil control. Make sure you place the grip the right way round on the pencil. 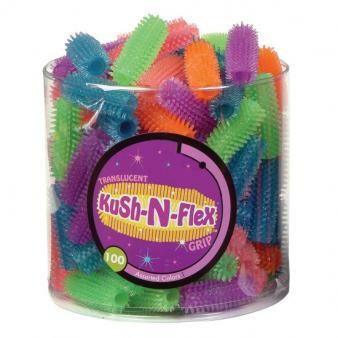 These spiky but soft comfort grips provide sensory feedback as to where the fingers are around the pencil. They’re particularly good for children who grip the pencil too tight, which causes finger and hand strain. You can also use them for pre-writing tactile stimulation, by placing two or three grips along the barrel of a pencil and rolling it between the palms: this ‘wakes up’ the hand ready for handwriting. This device helps children position the pencil correctly in their hand. The wrist loop encourages them to hold the pen at the right angle, and provides sensory input to promote the dynamic tripod grasp. There’s also an optional charm which the child can grip between the ring and little finger, which helps them to keep these fingers tucked into the palm. 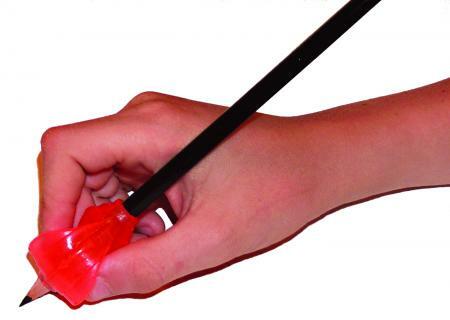 The larger loop of this grip goes around the child’s index finger and the smaller one around the pencil, to control the angle of the pencil when writing. It also reduces the amount of force needed to control the pencil. Note that the small size is very, very small – the medium size is better for most children. 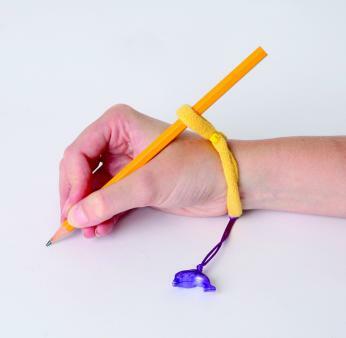 This stretchy grip fits over the entire pencil to make writing more comfortable. It’s ideal for children who have a tight grasp, develop red marks on the hand from applying too much pressure to the pencil, or complain of pain when writing. You can also cut it up to use as smaller comfort grips. Probably the oldest and best-known pencil grip, these come in a variety of diameters to fit most pens and pencils. They increase the grip size of the writing tool and provide three surfaces to encourage correct finger placement. 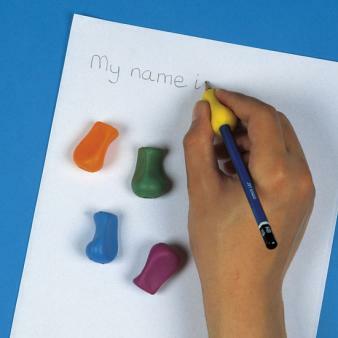 They’re useful for children who are unsure where to place their fingers, and also help to reduce handwriting fatigue. 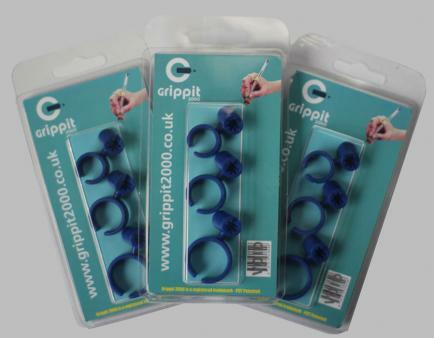 This large, soft, plastic grip encourages an open web space (the circular shape made by the thumb and forefinger when holding a pencil in the dynamic tripod grasp), which aids control and manipulation of the pen or pencil. It’s labelled R and L so that both right- and left-handers know where to position their thumb. This three-finger pocket grip fits onto any pen or pencil. The thumb and fingers are placed in the pockets – making sure to put them into the correct pockets. It creates a slight sensation of pressure around the fingertips, which gives strong sensory input into where the child’s fingers are in relation to the pen, so they don’t have to look at their hand and can concentrate on writing. It’s available in three sizes: small will fit any child, from nursery to the end of primary school. 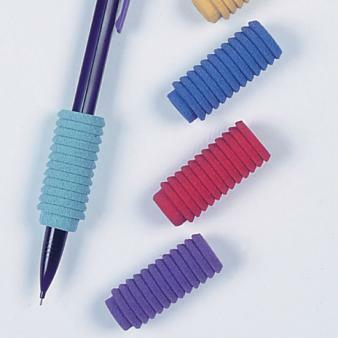 Soft foam pencil grips that provide comfort and stability for small fingers. The ridged surface makes it ideal for children who tend to grasp the pencil too tightly. Michelle van Rooyen is a handwriting tutor in the London and Surrey areas, and has over 20 years' experience as an occupational therapist.